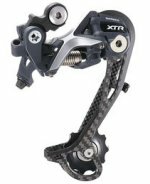 Front and rear Shimano XTR Derailleurs for the chainsets. Precision engineered rear derailleur for the ultimate in shifting performance and durability - as used by elite off-road racers the world over. Features: Low return normal spring uses spring to select lower gears for smoother changes up the block. High tolerance cold forged aluminium construction for extremely light weight, strength and durability. High rigidity wide outer link braces the pulley body to increase pivot joint rigidity. Four fluorine-coated link pivot bushings enhance low-friction shifting. Sealed bearing guide and tension pulleys for low friction and smooth running of the drivetrain. Mega9 high precision 9-speed drivetrain compatible. Detachable rubber bumper for inner chain cage guide to reduce noise and frame damage. Average weight: 198 grams for GS cage length. Low normal (reverse action).